Charles V (1500-1558) - Charles V was the grandson of Ferdinand and Isabella, and as a result, reaped the benefits of the empire they created. He further benefited from the fact that his grandparents' only son, John (his uncle), died before they did. So it was his mother, Joanna, who was next in line to be Queen of Spain. She married Philip the Handsome (Charles' father), who was heir to the Holy Roman Empire. Through a series of family tragedies, Charles was fast-tracked to the seat of the throne. Besides the death of his uncle, his father died in 1506, when he was only six years old. That same year, his mother was declared insane and whisked away to a nunnery. When his maternal grandfather died in 1516, he became King of Spain. When his paternal grandfather, Maximilain I, died in 1519, he became Holy Roman Emperor. Before the age of 20, without hardly lifting a finger, he was the most powerful man in Europe. But that does not mean that his power went unchallenged. There was another man, not from Europe, who was just as powerful, and who became his great rival; Suleiman the Magnificent of the Ottoman Empire (see below). Charles' control of the Holy Roman Empire and Suleiman's control of the Balkans led to frequent conflicts in Central Europe. Initially, Suleiman had the upper hand by expanding his territory north; but that expansion was finally stopped for good in 1529 at the Siege of Vienna (not to be confused with the more famous "Gates of Vienna" 150 years later). As a Catholic monarch, he opposed the Reformation. This was not much of an issue in Spain, which remained staunchly Catholic; but in the Holy Roman Empire, Protestantism was much more popular. Spain began to colonize the New World during Charles' monarchy, and the endeavors of Cortés, Pizarro and Magellan all occurred under his reign (all whio will be touched upon on this chart). 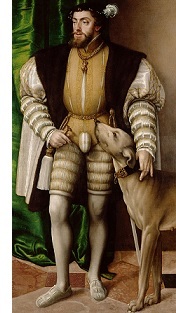 He remained King of Spain and Holy Roman Emperor until 1556, voluntarily abdicating two years before his death. The rigors of monarchy took its toll on Charles physically, and he retired to the peace and quiet of a monastery where he died in 1558.